Fields: "We'll keep our car lineup very fresh." "It's still a very healthy industry by historical standards, but there are stresses in it and we're getting ahead of that." 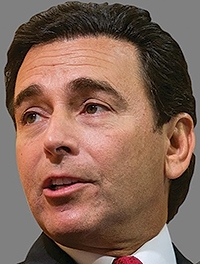 DETROIT -- Ford Motor Co. isn't giving up on cars, CEO Mark Fields says, even as the automaker abandons most U.S. production of them, but it also won't keep piling on discounts to boost sales "unnaturally." "You can only go so far in terms of trying to entice customers to purchase those kinds of products," Fields said in an interview last week. "We'll focus on some of the segments where customers are migrating towards, whether it's SUVs or pickup trucks, and we're doing nicely there." That shift in consumer preferences is behind Ford's plan to end small-car production in the U.S. by 2018 as it opens a plant in Mexico, a strategy that has made the company a constant punching bag for Republican presidential candidate Donald Trump. Ford, which benefited for years from its decision to forgo a federal bailout in 2009, has struggled to counter Trump's narrative that it is prioritizing profits over American jobs. Fields said the realities of the market make continuing to build small cars at the Michigan Assembly Plant near Detroit unfeasible. But it's not cutting jobs at the plant, instead repurposing it to make a Ranger midsize pickup and Bronco SUV, according to sources with direct knowledge of the plan. "At the end of the day, we have to make sure that as a business we are providing compelling products for customers at the right value that provide a good return for the company, so we can then reinvest in the products, in the people, in the facilities," Fields said. "With these exciting products that we're bringing in, it's actually a net win for the UAW." It's a major reversal of course for Ford, which converted Michigan Assembly from hulking SUVs to small cars after gasoline prices soared heading into the recession. Fields' predecessor, Alan Mulally, told USA Today in 2008 that the dramatic shift away from big gas guzzlers "is going to be permanent." Now, Fields said Ford is keeping that experience in mind even as it heads in the opposite direction, promising four new SUV nameplates by 2020. He said the "small-car offensive" Ford announced in 2008 -- which Fields executed as president of the Americas -- wasn't a misstep because it gave the company's car lineup a sorely needed overhaul, even if the assumptions underpinning it were mistaken. "You never know where consumer demand is going to go," he said. "We get questions of "Oh, why don't you just get out of the car business?' It's important that we have a full lineup of vehicles, because you never know what's going to happen with the economy with regulations, with customer preferences, and we want to be there for customers wherever they go. We'll keep our car lineup very fresh." Cars still account for a significant portion of Ford's U.S. sales: 28 per cent so far this year, down from 37 per cent in 2006, according to the Automotive News Data Center. But while large cars have plummeted from 16 per cent of its sales a decade ago to just two per cent today, midsize and smaller cars have risen to 26 per cent in 2016 from 21 per cent in 2006. Meanwhile, SUVs and crossovers have surged from 22 per cent a decade ago to 32 per cent this year. That's been good for Ford's bottom line, given the significantly higher margins on those vehicles. Ford doesn't disclose profits derived from individual products, but Morgan Stanley analyst Adam Jonas, in an Oct. 13 note to clients, conservatively estimated margins on Ford's full-size SUVs at 20 per cent, compared with 12 per cent for the company's North American operations in the first half, which was an all-time high. Despite that trend, Ford has warned that its earnings in the second half of 2016 will be lower than previously projected, especially in the third quarter. Ford plans to report its third-quarter results on Thursday, Oct. 27. Higher incentives across the industry, the end of six-year growth in U.S. demand and costs related to launching the Super Duty pickup are among the factors executives have cited to explain the decline. To put Ford in a better position for 2017 and beyond, the company is undertaking an aggressive cost-cutting initiative. "It's still a very healthy industry by historical standards, but there are stresses in it and we're getting ahead of that," Fields told Automotive News. Fields didn't say whether that could mean eliminating some jobs, explaining that it's aimed at making Ford "as efficient as possible." He said that could mean "reallocating costs we have in other parts of our business which may not be useful to us anymore given how the market has changed."